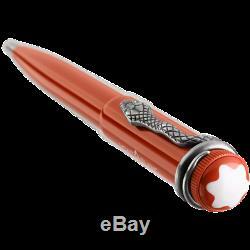 When it was developed in 1906, the Rouge et Noir fountain pen was considered an outstanding technical achievement, ensuring simple operation without the need for dipping the nib into an inkwell. The Heritage Collection Rouge et Noir celebrates the 110-year-old pioneering spirit of Montblanc. Reinterpreting the legendary writing instrument, it features a longer, slimmer silhouette and craftsmanship refined over generations, with coral precious resin in barrel and cap. Snake Clip in vintage look with matching fittings. The clip is made by a stamping and winding process in a special alloy metal, and is aged by a unique galvanic and stripping process. 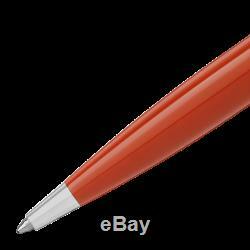 Ident Number: 114727 Ballpoint Pen Montblanc ballpoint pen refills: Mystery Black, Pacific Blue, Nightfire Red, Fortune Green, Amethyst Purple, Barbados Blue. Please give it some time before open any claims. Credit will be issued in the same form as payments received. YOUR SATISFACTION IS OUR GOAL! At Watchoss, with over 20 years of experience we have strived for providing brand new authentic watches at astoundingly low prices. Maintaining an excellent level of customer care and quality service has made Watchoss one of the largest watch distributors in the New York area. Our passion is providing the lowest possible prices on the watches you are looking for. We are a wholesale & online company located in NY with a large selection of fine watches at deeply discounted prices. All of our watches are 100% Authentic & Brand New and comes with original box and papers. Our overriding goal is to make sure our customers feel comfortable and satisfied with your experience here. At Watchoss, our sales and support teams are dedicated to making your experience with us a pleasant and lasting one. When placing your order, we take every possible step to protect your personal information. Shop with confidence, Watchoss guarantees the best products at the guaranteed best prices and to top it all off the BEST customer service on your order!! If you have any further questions or concerns or would like to inquire about our wholesale division. Watchoss is committed to offering the largest selection of fashion, discount and luxury watches on the web. With hundreds of watches to choose from you are sure to find a watch that reflects your own personal style. Whether you are looking for a distinguished watch for elegant events, a durable wristwatch for athletic activities or a precision timepiece to be used every day, Watchoss is you one-stop online shop. Watchoss has what you are looking for, all in one place, all guaranteed authentic and all at the lowest online prices. With just a few clicks of your mouse, you can compare the style, look, feel, and price range of a plethora of watch brands. Once you browse our incredible selection of luxury and discount men's and women's watches, Watchoss is certain that you will find exactly the quality and style you are looking for. At Watchoss we have a commitment to putting the customer first. Our helpful and courteous team, keep customers coming back time and time again. Remember, whether you shopping for yourself or are looking for the perfect gift, our vast selection, low prices, guaranteed authentic products and fantastic customer service makes Watchoss the place to find exactly what you are looking for. Don't let time get away from you, keep precise with a watch from Watchoss. 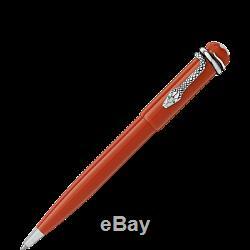 The item "Montblanc Heritage Collection Rouge et Noir Coral Ballpoint Pen 114727" is in sale since Tuesday, February 6, 2018. 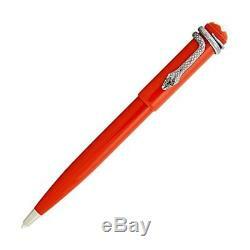 This item is in the category "Collectibles\Pens & Writing Instruments\Pens\Ballpoint Pens\Montblanc". The seller is "watch_oss" and is located in Brooklyn, New York. This item can be shipped worldwide.